Offspring2 celebrated a birthday recently. He is the photographer, two of his favorite subjects are night skies and critters. I blended the sky onto Strathmore Bristol paper (blends so easily on this smooth surface! ), and when it was dry, I flicked Kuretake white pearl paint onto it. I did struggle with how to ground the scene – I finally decided on a strip of green paper covered with die cut leaves. Supplies: Stamps – Lawn Fawn, Reverse Confetti, paper – Neenah Classic Crest Solar White, Stampin’ Up! Always Artichoke (retired), Bravo Burgundy (retired), Brushed Silver, Cajun Craze, Cherry Cobbler, Crushed Curry, More Mustard (retired), Pumpkin Pie, Shimmery White (retired), Strathmore Bristol, inks – Copic E15, E19, E21, E33, 100, Tim Holtz/Ranger Distress Inks Blueprint Sketch, Chipped Sapphire, Salty Ocean, VersaFine Onyx Black, Vintage Sepia, dies – Lawn Fawn (animals), My Favorite Things (leaves, pierced rectangle), Spellbinders (circle), watercolor – Kuretake Gansai Tambi, embossing powder – Spellbinders Detail clear. 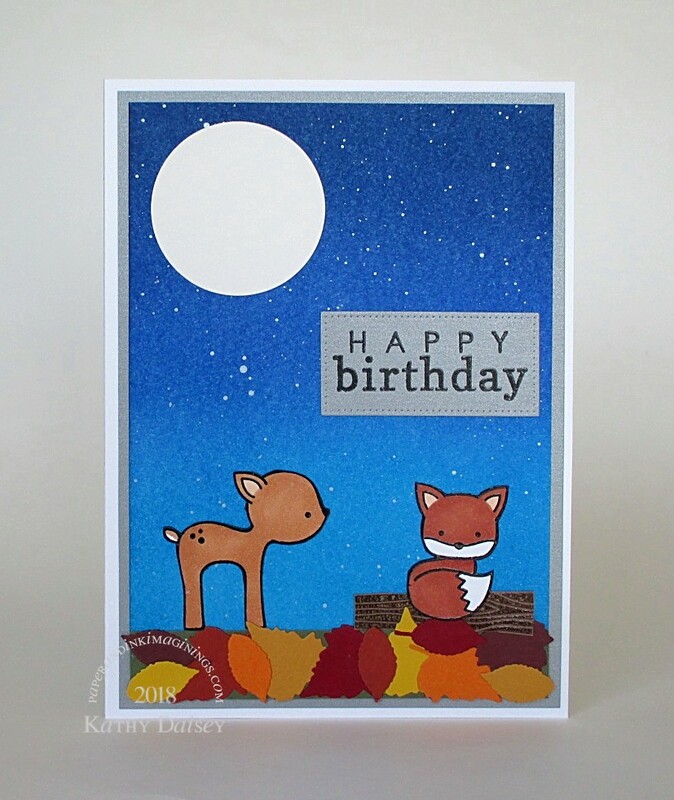 Categories: birthday, card | Tags: Bristol, card, Copics, Kuretake, Lawn Fawn, My Favorite Things, Neenah, Ranger, Reverse Confetti, Spellbinders, Stampendous, Stampin' Up!, Strathmore, Tim Holtz, Tsukineko, VersaFine | Permalink.